Toyota cars are world’s one of the most trusted vehicles and have good brand image. These cars have become synonyms of reliability and quality. Toyota has introduced some nice offers for customers. These offers are available on Innova, Etios and Etios Liva cars. Company has recently launched the updated version of Innova which has many new features in terms of looks, comfort, quality etc. Same happened with Etios twins in year 2013. Toyota Innova is available with cash benefits of upto Rs. 25,000. These price benefits are available in the form of genuinely accessories worth Rs. 10,000, Exchange offer worth Rs. 15,000 and loyalty/corporate bonus worth Rs. 5,000. Etios is available with cash benefits of upto Rs. 30,000 on petrol and Rs. 27,500 on diesel. This includes genuine accessories worth Rs. 15,000 on Petrol and Rs. 12,500 on Diesel, attractive exchange offer of Rs. 10,000 and loyalty/corporate bonus worth Rs. 5,000. 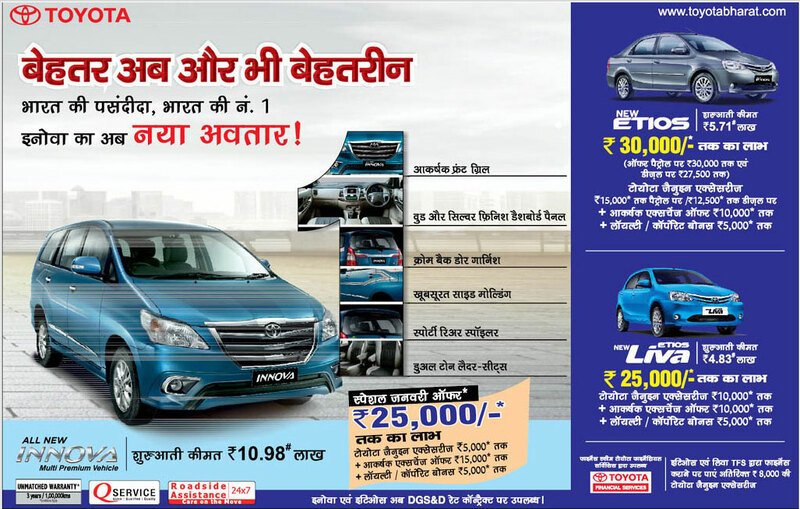 Etios Liva is available with cash benefits of upto Rs. 25,000. This includes genuine accessories worth Rs. 10,000, attractive exchange offer of Rs. 10,000 and loyalty/corporate bonus worth Rs. 5,000.